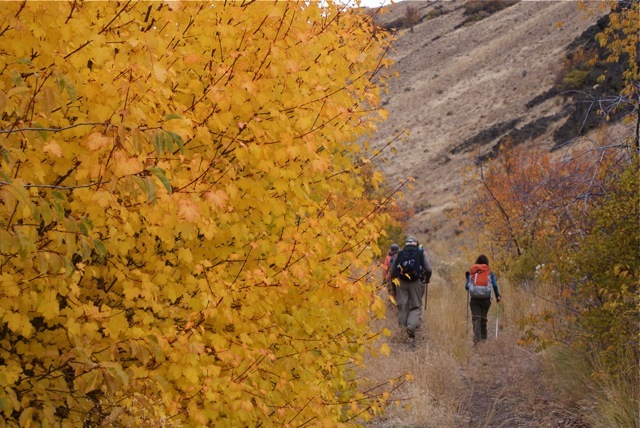 During the month of October, hikers in Western Washington are fervently seeking out vistas with the elusive golden larches. 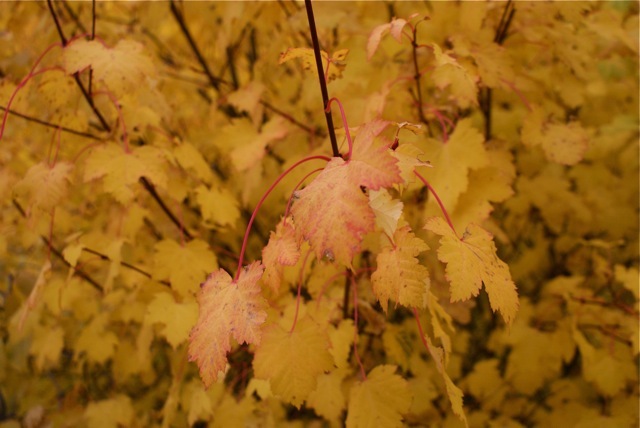 Larch are unusual evergreens in that they are also like a deciduous; in the fall, their needles change color and later get dropped. They seem to take up residence in some of the most beautiful high country in the state, such as the North Cascades, the Stuart Range and Leavenworth areas. I have seen lots of larches, but this year, I was seeking something a little different. 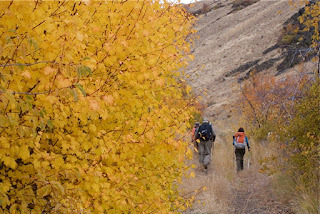 I had been to Black Canyon in the spring (link to post here) to escape the rain and clouds of the westside and get a sneak preview of some spring flowers, but I had read reports of some beautiful fall color and, in particular Golden Aspen, and wanted to see it for myself (and the group of Mountaineers who would accompany me). 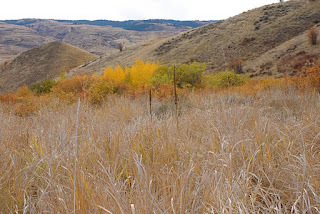 The drive to the trailhead had me very optimistic, as I had been worried that it was too late in the season for color and we'd be walking amongst barren trees. 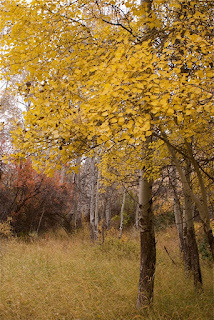 All along the road, there were trees with yellow leaves, orange leaves and still some green to add contrast. Then, we saw a big white bunny (no, we did not follow it down its hole) and it was probably a jackrabbit, but it's much more fun to call it a big white bunny. As we came around a corner, a couple of deer were crossing the road and they went hopping off, looking a little like kangaroos, when they spotted us. To our right, we saw the rest of their friends and family, about 6 of them gazing at us with big eyes, waiting for the road to be clear. Driving slowly up the rough road (apologies to Suzanne's car), there was a baby owl sitting right at the edge of the road, on the ground. It stayed motionless as all three of our cars passed by. The color started again, right at the trailhead and stayed with us wherever there was a water source for the trees. 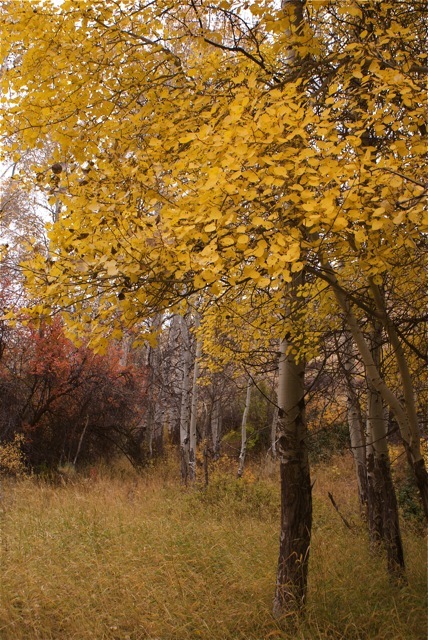 The area of the cabin was starkly beautiful, with contrasting aspen, other colorful trees and the dark of the cabin's aging wood. We followed the canyon up to Umtanum Ridge and were treated to a view of not only the Stuart Range, but the entire Teanaway peaks. It was like having a mountain scene set to infinity. Then, we looked to the south and saw a big, white blob sitting above a distant ridge. It was very disorienting, but at the same time we were certain it was Mt Rainier. She has that certain majestic look (and also follows me nearly everywhere I go: previous post). 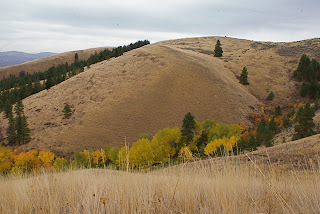 We traversed the ridge and could see trees and colors in the folds of the hills; wherever there was water, it supported life and beauty. We spotted our canyon as the most beautiful, of course, and soon found the trail to descend through the trees, past the old cabin and back to the trailhead. 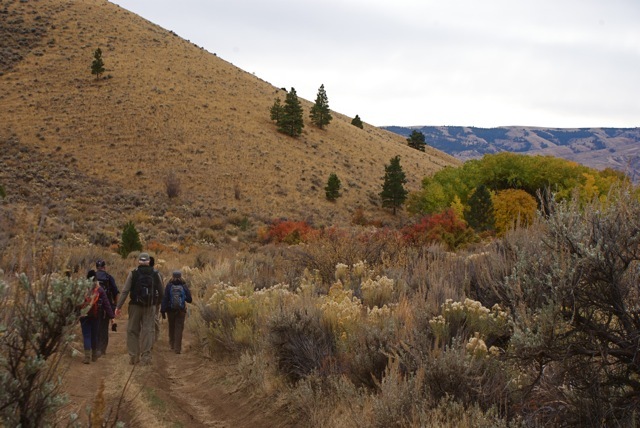 Many in the group commented that it was a welcome change of scenery and proved that the desert is not just for spring hiking anymore.